It is no secret the Washington Capitals are loaded with offensive talent. The team lights the lamp with regularity, currently sixth in the National Hockey League with 244 goals and seventh with a 3.38 goals per game average. Obviously, any team with current NHL goal leader Alex Ovechkin driving its goal total will be ranked near the top of the stats page, but the Caps have spread the wealth in the goal scoring department this season. Washington has four skaters, including Ovechkin, who have scored 20 or more goals, and has three more on the cusp cracking the 20-goal mark. The depth of scoring makes Washington a tough team for defenses to handle. The goals have come from both likely and unlikely sources. Each of the forwards on the top two forward lines has at least 18 goals thus far. Ovechkin’s 48 goals power the top line, and Evgeny Kuznetsov has navigated an uneven season to pot 18 goals. 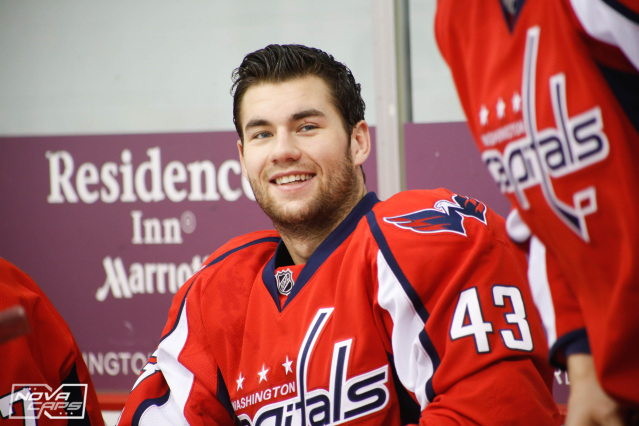 The surprise goal scorer on the first line is Tom Wilson. Top Line Tommy’s career-high 20 goals have come in just 53 games. Thanks to an 18.0 shooting percentage, Wilson is cashing in at a goal per game clip (.377) exceeded by only Ovechkin (.676) and Tyler Lewington (1 goal in 2 games played). Wilson’s evolution from big hitter to all-around power forward lends balance to the top line and opens even more room for the other skill players. The second line also includes two 20-goal wingers and a center with 18 goals. T.J. Oshie remains an offensive leader, tied for second on the team with 21 markers. Nick Backstrom has ridden a recent hot streak to pile up 18 goals on the campaign. Jakub Vrana, a talented sharpshooter with speed to burn, has developed into a consistently dangerous scorer. His career-high 21 goals are tied for second on the roster. Brett Connolly has been the beneficiary of the strong play of the third line. Connolly, Lars Eller, and Carl Hagelin routinely work the cycle on the forecheck, hemming teams in their defensive zone. Connolly has earned consistent playing time and has seized the opportunity. Using the laser-like wrist shot that helped make him the sixth overall pick in the 2010 entry draft, Conno has netted a career-best 19 goals so far this season. If Connolly, Kuznetsov, and Backstrom can reach the 20-goal plateau in the team’s final ten games, it would give Washington seven 20-goal scorers for the season. How does that offensive depth stack up with the rest of the NHL? If, for the sake of this argument, we assume a player who currently has 17 or more goals will reach 20 goals, then only the Toronto Maple Leafs will match the Caps in number of 20-goal scorers. Having seven 20-goal scorers would also rank this team highly in the Capitals’ record book. Only five Washington squads have previously possessed seven or more 20-goal scorers. The most recent Caps’ team to reach the mark was the high-flying President’s Trophy winners of 2009-2010. The 1992-1993 Capitals, playing before the neutral zone trap and improved goalie equipment cut down on goal scoring league wide, scored 325 goals and boasted a whopping nine 20-goal scorers. Peter Bondra led the balanced attack with 37 goals. The defense joined in the fun that year with defensemen Kevin Hatcher (34 goals), Al Iafrate (25 goals), and Sylvain Cote (21 goals) all breaking the 20-goal barrier. Of course, putting the puck in the net at a prodigious rate does not guarantee team success. The 2009-2010 and 1992-1993 teams were each fun to watch but flamed out with first round playoff exits. Let’s hope this season’s stellar scorers make a much deeper run into the Spring. Connolly joined the 20 Goal Club vs the Devils. Kuznetsov added a goal and now sits at 19 goals for the season.